“Improvements in construction, business services and manufacturing — along with a needed increase in public-sector jobs — combined to boost Iowa's job picture in April as the state continued its slow and choppy recovery. “Over the last year, Iowa has been taking two steps forward and one back in three-month increments. April represented a step forward after a small job decline in March. As the graph at right indicates, the most of the increases have tended to be larger than the declines over that time, so the state's economy is gaining. — Nonfarm jobs rose in April by 5,800, to 1,496,300, from 1,490,500 in March; April 2012 jobs were up 18,100 from April 2011. — Nonfarm jobs are 32,100 behind the May 2008 peak of 1,528,400, and 28,900 behind the level at the start of the last recession in December 2007. — The unemployment rate was 5.1 percent in April, down from 5.2 percent in March and down from 5.9 percent a year earlier. — The labor force, those working or looking for work, rose 900 for the month and was down 1,200 over the year. — Initial unemployment claims were down — by 12 percent, to 11,189 — for the month, and down 27 percent over the year. — Iowa averaged a monthly increase of 1,500 jobs over the last 12 months. 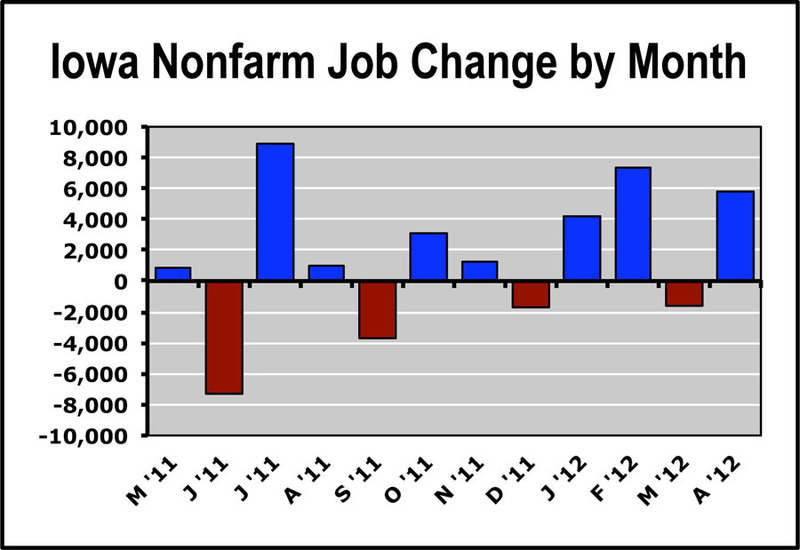 — Nonfarm jobs are above the year-ago level for the 19th month in a row. — Construction jobs led gains in April with a 2,700 increase; professional and business services rose by 1,500, government jobs by 1,100 and manufacturing by 1,000. The biggest decline was in trade, transportation and utilities, 1,100, which IWD attributed to the transportation and warehousing section of that category. — Over the year, manufacturing is showing the strongest recovery, with 12,500 of the overall 18,100 net increase in jobs in that period. Construction is up 7,200, while government jobs, down 2,900, and trade, transportation and utilities, down 2,100, are the principal trouble spots and are the two largest job sectors.